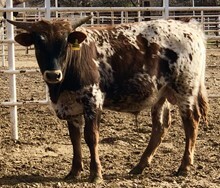 A beautiful, friendly cow, Aurora has great breeding, a nice full body, and thick horns. 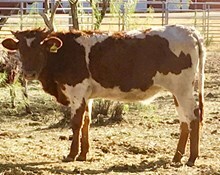 She has been a great producer for El Coyote Ranch. "Aurora delivered a spectacular heifer calf March 1, 2017 (CER Phenomenal Ashley) sired by Ranchero ECR (Cowboy Chex x ECR Alamo’s Rose)."